Treating MS. “Co-culture of primary rat hippocampal neurons and astrocytes stained for βIII-tubulin (green), GFAP (red) and DNA (blue). Neurotoxicity.” Janet Anderl, Millipore Corporation, USA. Copyright, 2010, GE Healthcare. Released under a Creative Commons Attribution 2.0 Generic License CC BY 2.0. Recolored for use on the MSDF. The Power of Connections. “Scanning electron micrograph of a Neuron. Neurologic Main." Copyright, 2008. Derivative work by L’Aquatique of “Neuron-SEM-2." Copyright 2003, Nicolas P. Rougier. Released under the GNU General Public License. Gray matters. Reprinted by permission from Macmillan Publishers Ltd: Nature Reviews Neuroscience. Axonal conduction and injury in multiple sclerosis: the role of sodium channels. SG Waxman, 7: 932-941, copyright 2006. All that Jazz. "New Orleans, Louisiana, USA." Nighttime view of multi-story building with decorative iron galleries, Royal Street at St. Peter, French Quarter. Copyright, 2004, Falkue. Released under the GNU Free Documentation License. News Highlights box. 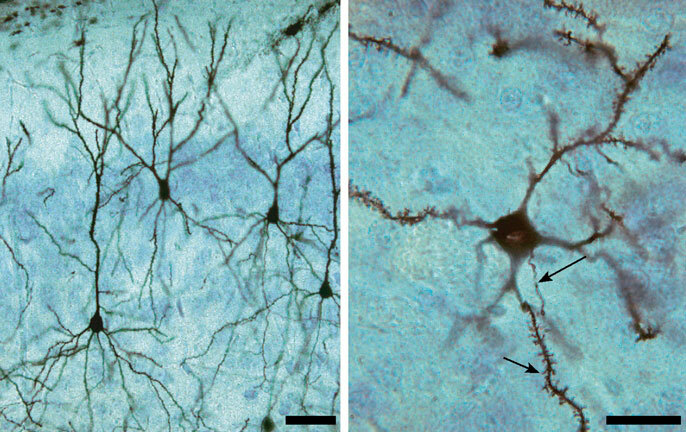 “Neurons.” This file is in the public domain PD-US because its copyright has expired. This applies to Australia, the European Union, and those countries with a copyright term of life of the author plus 70 years. The original file, author unknown, is sourced from here. This is a faithful photographic reproduction. Featured Forums box. “Processed pictures of oligodendrocytes in culture.” 2007, jakeyoung64. Released under a Creative Commons Attribution 2.0 Generic License CC BY 2.0. Meetings & Events. “HHR Meeting." Copyright 2007 Michael Hashizume. Released under a Creative Commons Attribution 2.0 Generic License CC BY 2.0. Recolored for use on the MSDF. Funding Opportunities. “Paper Weaving.” Copyright 2007, Joel Penner. Released under a Creative Commons Attribution 2.0 Generic License CC BY 2.0. Jobs. “EPA gulf breeze laboratory: pathobiology lab. Linda Sharp, assistant to the pathobiologist, makes slides of histological sections. This is one of the procedures in the study of tissues and cells of estuarine and marine animals exposed to pesticides," 1972. This file is in the public domain PD-US because it is a work of the United States Federal Government under the terms of Title 17, Chapter 1, Section 105 of the US Code. Recolored for use on the MSDF. Member Directory. “AD at Big Three Meeting American University Campus Katzen Arts Center Abramson Family Recital Hall 1." Copyright 2012, US Department of Education. Released under a Creative Commons Attribution 2.0 Generic License CC BY 2.0. Bulletin Board. “Tacks." Copyright 2011, Tony L. Wong. Released under a Creative Commons Attribution 2.0 Generic License CC BY 2.0. Recolored for use on the MSDF. Useful Links. “Unplugged – no computer, no internet, possible?” Copyright 2011, photosteve. Released under a Creative Commons Attribution 2.0 Generic License CC BY 2.0. Recolored for use on the MSDF. Resource Notes box. “Culture Tubes” (link to http://www.flickr.com/photos/heypaul/107326169/). Copyright 2006, Hey Paul (link to http://www.flickr.com/people/heypaul/). Released under a Creative Commons Attribution 2.0 Generic License CC BY 2.0 (link to http://creativecommons.org/licenses/by/2.0/deed.en). Drug Development Pipeline. “Pills." Copyright 2010, e-MagineArt.com. Released under a Creative Commons Attribution 2.0 Generic License CC BY 2.0. Tissue Repositories. “DNA lab.” Copyright 2012, School of Natural Resources. Released under a Creative Commons Attribution 2.0 Generic License CC BY 2.0. Recolored for use on the MSDF. MSGene. “DNA Rendering.” Copyright 2007, ynse. Released under a Creative Commons Attribution-ShareAlike 2.0 License CC BY-SA 2.0. Animal Models. “Single Islet.” Copyright 2011, Alfred1221. Released under a Creative Commons Attribution-ShareAlike 3.0 Unported License CC BY-SA 3.0. Recolored for use on the MSDF. Clinical Trials. “Tetanus Shot Time.” Copyright 2010, Blake Patterson. Released under a Creative Commons Attribution 2.0 Generic License CC BY 2.0. Recolored for use on the MSDF.